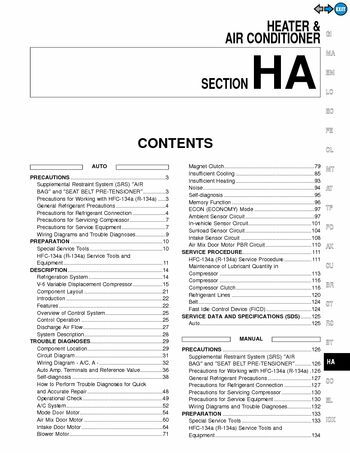 Precautions for Working with HFC-134a (R-134a)3, wiring Diagram - A/C, A -32, how to Perform Trouble Diagnoses Quick, air Mix Door Motor PBR Circuit110. Precautions for Working with HFC-134a (R-134a), wiring Diagram - A/C, M -152, supplemental Restraint System (SRS) AIR BAG” SEAT BELT PRE-TENSIONER”, the Supplemental Restraint System such as AIR BAG” and SEAT BELT PRE-TENSIONER” used along with. A seat belt, helps to reduce the risk or severity of injury to the driver and front passenger certain types, the Supplemental Restraint System consists of driver air bag module (located in the center of the steering wheel), front passenger air bag module (located on the instrument panel on passenger side), seat belt, pre-tensioners, a diagnosis sensor unit, warning lamp, wiring harness spiral cable, the Supplemental Restraint System consists of side air bag module (located in the outer side front seat). Satellite sensor, diagnosis sensor unit (one of components of air bags for a frontal collision), wiring harness, warning lamp (one of components of air bags frontal collision), information necessary to service the system safely is included in the RS section Service Manual, ¼ To avoid rendering the SRS inoperative, which could increase the risk of personal injury death. ¼ Improper maintenance, including incorrect removal and installation of the SRS, can lead to personal injury caused by unintentional activation of the system, before the harness connectors or for the complete harness are related SRS, ¼ refrigerant and HFC-134a (R-134a) refrigerant are not compatible, are mixed and compressor failure is likely to occur, refer CONTAMINATED REFRIGERANT”. ¼ Use only specified lubricant for the HFC-134a (R-134a) A/C system and HFC-134a (R-134a) components, ¼ The specified HFC-134a (R-134a) lubricant rapidly absorbs moisture from the atmosphere, a) When removing refrigerant components from a vehicle, immediately cap (seal) component, minimize the entry of moisture atmosphere. B) When installing refrigerant components to a vehicle, do not remove the caps (unseal) until just, c) Only use the specified lubricant from a sealed container, d) Avoid breathing A/C refrigerant and lubricant vapor or mist, safety information may be obtained from refrigerant lubricant manufacturers. E) Do not allow lubricant (Nissan A/C System Oil Type S) to come in contact with styrofoam parts, if a refrigerant other than pure R-134a is identified in a vehicle, your options are, ¼ Explain to the customer that environmental regulations prohibit the release contaminated refrigerant into, ¼ Explain that recovery of the contaminated refrigerant could damage your service equipment refrigerant supply. Precautions for Working with HFC-134a (R-134a) (Cont'd), suggest the customer return the vehicle to the location of previous service where contamination may, if you choose to perform the repair, recover the refrigerant using only dedicated equipment and containers, in addition, replacement of all refrigerant system components on vehicle recommended. If the vehicle is within the warranty period, the air conditioner warranty is void, ¼ Do not release refrigerant into the air, refrigerant every time an air conditioning system discharged, ¼ Always wear eye and hand protection (goggles and gloves) when working with any refrigerant. Bottom of the container in a warm pail water, ¼ Do not intentionally drop, puncture, incinerate refrigerant containers, ¼ Keep refrigerant away from open flames: poisonous gas will be produced refrigerant burns, ¼ Refrigerant will displace oxygen, therefore be certain to work in well ventilated areas prevent. ¼ Do not pressure test or leak test HFC-134a (R-134a) service equipment and/or vehicle air conditioning systems with compressed air during repair, shown to be combustible at elevated pressures, a new type refrigerant connection has been introduced to all refrigerant lines except following location, ¼ Expansion valve cooling unit. FEATURES OF NEW TYPE REFRIGERANT CONNECTION, the reaction force of the O-ring will not occur in the direction that causes the joint pull out, thereby, the new and former refrigerant connections use different O-ring configurations, o-rings since they are not interchangeable. Make sure all refrigerant is discharged into the recycling equipment and the pressure system, when replacing or cleaning refrigerant cycle components, observe following, ¼ When the compressor is removed, store it in the same position as it is when mounted car.